IMN Actualités The reliability of anatomical connectivity data of the human brain challenged by 20 international teams of research in diffusion imaging and tractography. The reliability of anatomical connectivity data of the human brain challenged by 20 international teams of research in diffusion imaging and tractography. Diffusion magnetic resonance imaging (dMRI) is used to reveal in vivo the white matter bundles of the human brain by measuring the diffusion of water molecules, especially along axons. It is then possible by tractography to reconstitute step by step the paths of the bundles of white matter fibers then represented in the form of a tractogram. This tractogram is a representation of the global anatomical organization of the white matter in vivo, made of millions of virtual fibers whose color code represents their orientation in the white matter and produces remarkable representations of the main beams. … to the ground truth of the anatomy of the human brain. There are a large number of tractography algorithms, each with its own ability to reproduce as closely as possible the organization of the white matter fibers. However, this organization is very complex and today there are no exact definitions of the trajectories and endings of all the white matter fibers of the human brain. The absence of this ground reality makes it difficult to estimate the degree of reliability of the various tractography algorithms. A challenge was then launched for the researcher community dealing with diffusion imaging and tractography at the ISMRM2015 meeting: to provide the best possible tractographic reconstruction of an imaging dataset containing a set of bundles whose trajectories and endings were clearly identified. The results of this challenge have just been published in Nature Communications. Twenty worldwide research teams took up this challenge, submitting 96 separate tractography proposals. Most encouraging is that most current advanced algorithms produce tractograms containing 90% of the valid bundles included in the original data. However, the same tractograms also contain many more (too many!) invalid than valid bundles, and half of these invalid bundles have been consistently identified by all research teams. This large international study demonstrates and confirms the fundamental ambiguities inherent in the reconstruction of white matter fibers when it is solely based on the orientation information of the diffusion of water molecules. This must be taken into account when interpreting tractography results revealing the anatomical connectivity of the human brain. 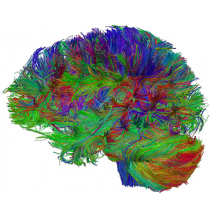 Despite its limitations, tractography is currently the only tool for mapping the anatomical connectivity of the human brain in vivo. There is no doubt that the results of this challenge will foster the development of new tractography algorithms by integrating in particular anatomical priors. There is an urgent need for methodological innovation in tractography to improve knowledge of the white matter anatomy of the human brain and to build anatomically correct connects.